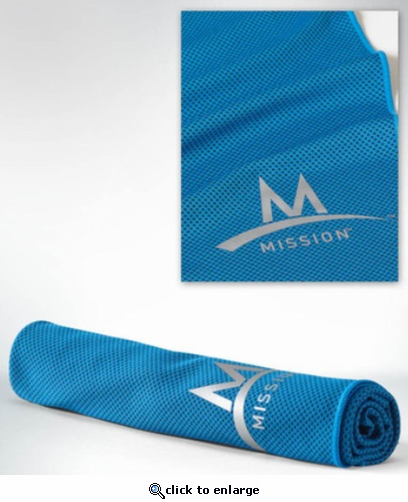 We love the Mission EnduraCool towels and you will too! These great cooling towels are proven to work and help regulate your body temperature while exercising, working outdoors, or doing anything where you need to feel cooler and more comfortable. The Mission EnduraCool Instant Cooling Towel is made from a new proprietary performance fabric that instantly cools when soaked with water, wrung out, and then snapped in the air to activate the cooling properties. The high-performance, multi-yarn fiber is powered by patented technology, Powered by Coolcore, and works by absorbing moisture and perspiration into the fabric core where the unique radiator-like fiber construction circulates water molecules and regulates the rate of evaporation to create a prolonged cooling effect. Stays cool for up to 2 hours! About Mission Athletecare MISSION is the first and only line of Athlete-Engineered products designed to enhance performance in training and competition. Launched in 2009, MISSION Athletecare has quickly become a driving force of innovation in the sports industry uniquely focused on products that help athletes prepare, perform, and rehab from competition. MISSION was co-founded by a premier group of world-class athletes including 13-time Grand Slam Tennis Champion Serena Williams, 7-time MLB All-Star David Wright, and NBA Champion Dwyane Wade among others. All of these althetes wanted to be part of the solution to the void of Athletecare products available to athletes in the marketplace.